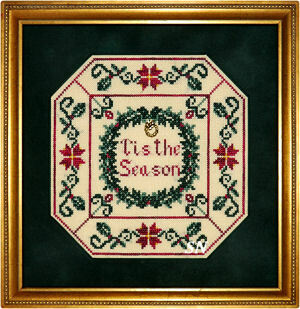 Melinda Billam returns to Cross Stitch designing with her new company -- Scissor Tail Designs. In our *Olden Days* (way back to my first years in business!!!) Melinda designed under the name of Lindy Jane Designs. It confused everybody, and everyone always thought I was her, and she was me! ('cause my name is Lindy -- I guess!... and we were both from Tulsa... and sometimes I even helped in her booth at Market, so nobody even stood a chance of figuring out who was who!) Anyway, Ms Melinda is from Tulsa, and we see her in the shop all the time. Enjoy her new designs! Pretty and delicate... small classics! Weeks Monkey Grass and Garnet hand-dyed flosses, a few Mill Hill gold seed beads and some sparkly Rainbow Gallery Petite Treasure Braid, this pretty piece finishes approx 4 x 4 on 32ct white. 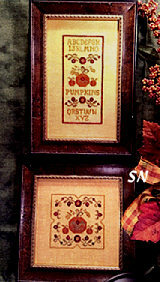 Stitched on 32ct Desert Sand Linen, this is full of Autumnal color. Endive, Gingersnap, Grecian Gold and Red Currant... the colors really look good on that warm linen. 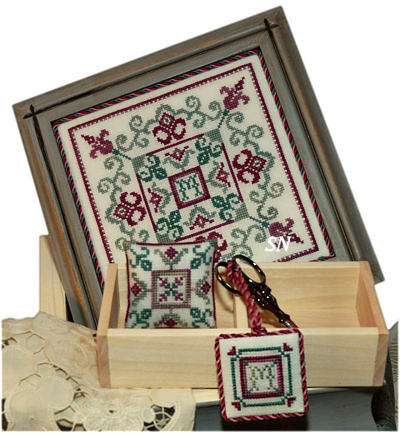 Finishes approx 3-1/2 x 7-1/2... Melinda shows lots of other finishing options for smaller portions of the stitching! 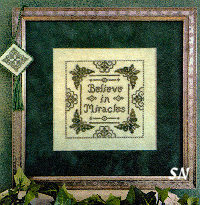 This is worked on 28ct Waterlily Linen with Bayberry Sampler Thread (converts to DMC 3346). A pretty tone-on-tone, you can choose ANY color scheme you like. 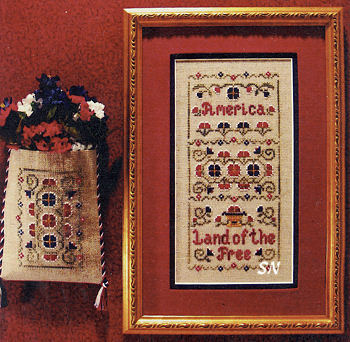 The main piece is 85 in stitch count, the fob is only 45... so they finish 5 x 5 and 1-1/2 x 1-/12! Worked on 32ct Summer Khaki Linen, the main piece finishes approx 8-1/2 x 2-1/2 in size. 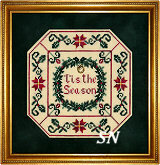 Consider stitching this with room to add one or more special photos in another hole of the same framing mat. 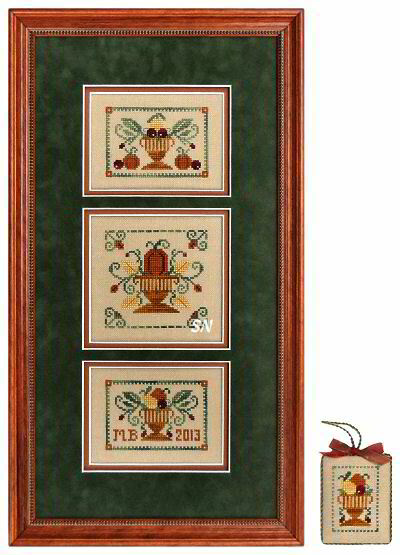 Or what about adding initials or a special date or place to remember? Colors are Berry Cobbler, Cypress and Boysenberry. 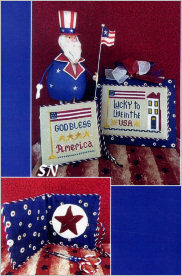 Two fun little patriotic designs, Lucky is finished into a stand-up piece, while God Bless is made into a needle book. You can see the inside of Melinda's case -- the red wool star is on top of a cream wool circle to make it all stand out against the deep color of the lining. A trio of red, white and blue hearts -- all stripes and coverlet-inspired to me -- you'll need only Midnight, Claret and Grits floss for these. 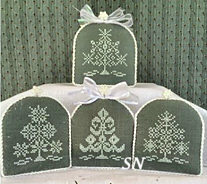 They are shown on a light blue linen... white or an opalescent might be pretty as well. Each heart finishes approx 3-1/4 inches in size. That little tree has 15 decorated eggs hanging from it! Stitched on 32ct Cram Belfast, it uses Clay Pot, Shutter Green, Peoria Purple and DMC 3889 flosses. This little tree has 10 Carrots on it!!! Every Bunny is Welcome here... and what bunny wouldn't LOVE to have her own carrot tree? 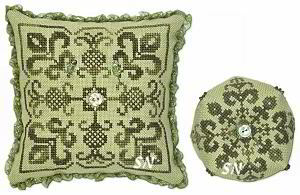 Stitched on 32ct Cream Belfast in Clockwork, Monkey Grass and DMC 840, each of the blocks finish approx 3 x 4. 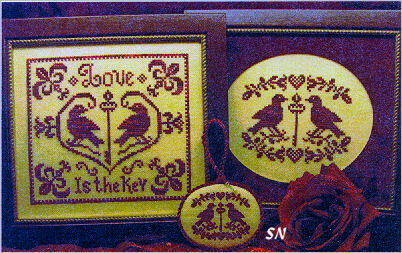 A pretty monochromatic study of Lovebirds... both of these variations are stitched with Weeks Garnet hand-dyed floss. 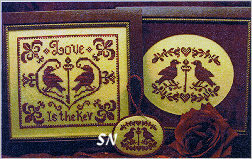 The larger one measures 85 x 75 so will finish approx 5 x 6 on 28ct, while the smaller one will be 3-1/2 x 4. I think they would make pretty pin cushions! This is a trio of charts that **each present one-third of the final design. 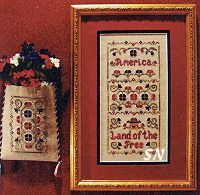 ** Part one includes the border. Worked on 28ct Lavender Provence Linen you'll need Blooming Crocus Classic Colorworks hand-dyed floss to create this lavender effect! Each block is approx 3-1/2 inches square, so the final combo will be 9-1/2-ish long. If purple isn't your favorite.... shop for a pretty fabric that is FIRST, and then find a pretty floss color to accent the fabric! 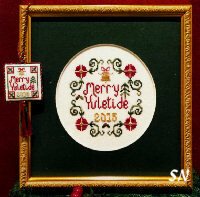 Scissor Tail Designs has several new things... this pair of designs is stitched on 28ct Stoney Point Linen and features Rainbow Gallery's Petite Treasure Braid in an opalescent silvery white color. Everything is garnished with Mill Hill beads of 3041 as well. 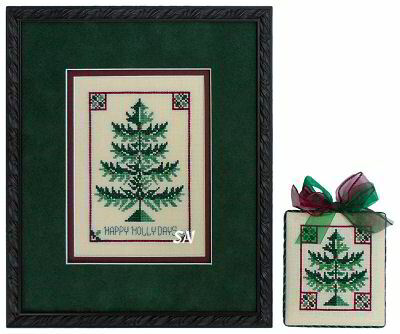 The tree finishes approx 5 x 6-1/2 while the matching ornaments are approx 2-1/2 inches square. Offered as charts. 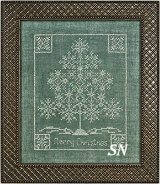 Stitched with Weeks, Gentle Art and DMC flosses on 32ct French Lace linen, this finishes approx 5-1/2 inches square. 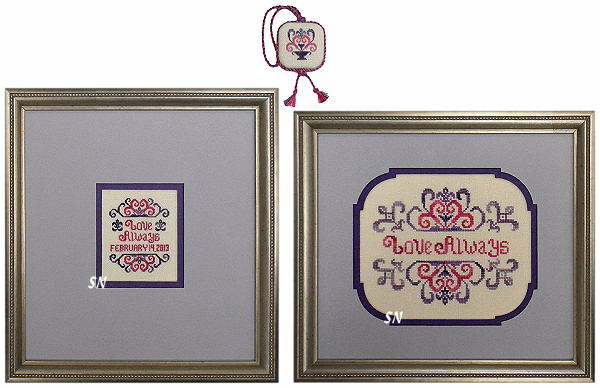 The matching pin cushion is only 37 x 37 in stitch count and the scissor fob measures in at a petite 23 x 23! It's a cute set, and actually can be stitched in any color combination you like -- so check that stash for something pretty if you feel like it! Offered as the chart. 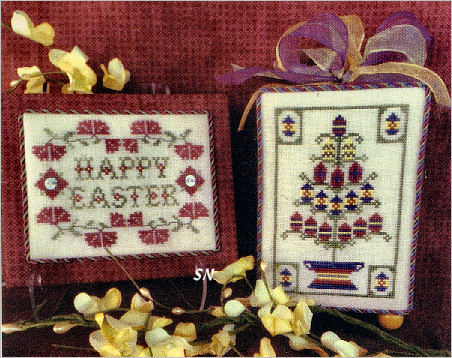 Here is a pair of designs -- I imagine Spring and Summer will be coming closer to those seasons!! 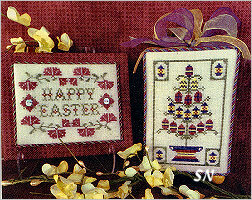 Measuring 97 x 97 stitches each, they are worked with DMC and a few hand-dyeds. Each chart comes with it's charm that is featured in the center panel. Yikes! 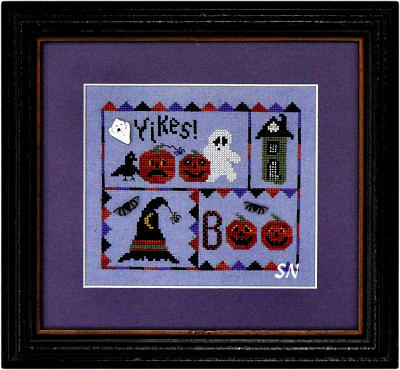 Scissortail has a cute new piece with 4 smaller panels of Halloween-y things... all stitched with DMC and overdyeds on Week's 30ct Peoria Purple Linen. Add some bat buttons and the ghost... and the 5 x 6 ziggy-zaggy border... and you're ready to scare a crowd! Offered as the chart, buttons separately. 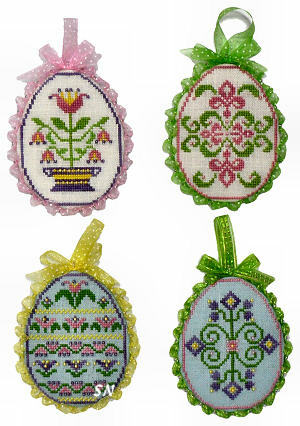 Scissor Tail Designs has some cute smalls to stitch for Easter. 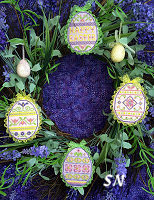 Her Bling Eggs are worked on 32ct white and pastel linens and garnished with seed beads. The charts offer 4 eggs, each approx 2-3/4 x 3-1/2. 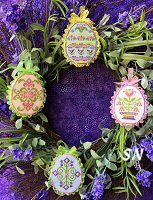 There will be one more chart of 4 more eggs coming in the next two weeks -- they're stitched on all the pretty new Zweigart pastel linens. 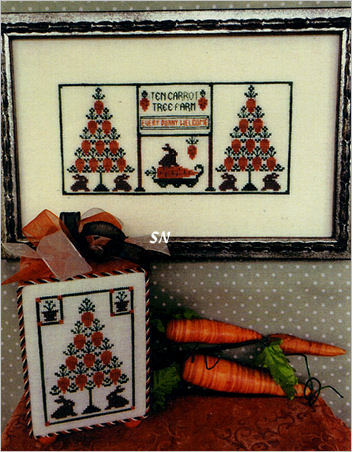 Then, Spring Trio presents three panels of bunnies and baskets -- they measure approx 4-1/2 x 2-1/2 each. Pretty as pin cushions, cubes or framed like in the pic... the tiny scissor fob is a part of the top design that is worked over one! 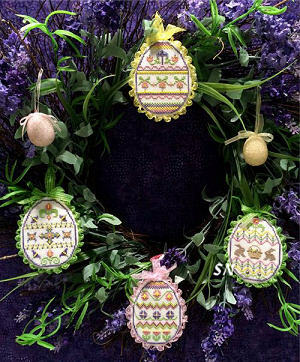 Both the eggs and Spring Trio designs are offered in chart format. 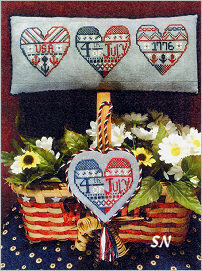 Some patriotic posies! Scissor Tail's 3-1/2 x 7-3/4 inch piece is worked on 32ct Natural linen in Gentle Art Sampler Threads of Black Raspberry Jam, Baby Spinach, Claret, Gold Leaf and Picket Fence. The smaller hanging bag is that central band simply turned on its side! Offered as a chart. 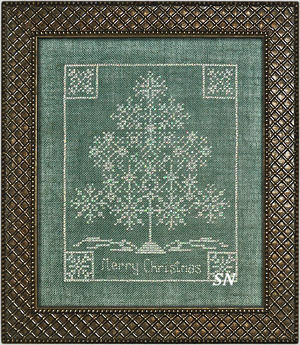 Stitched on 32ct Light Sand, this finishes approx 4 x 5-1/2, and uses Razzleberry, Holly and Green Pasture handyeds. 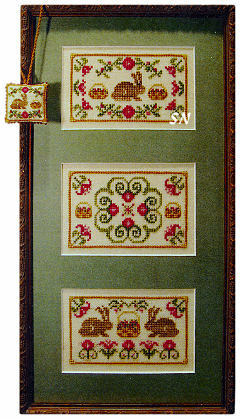 Stitched on 32ct Waterlily, each piece measures between 1-1/2 and 3 inches square. Choose one hand-dyed color of thread -- anything you like -- and change out the fabric if you want to as well!! Finish as pin cushions, ornaments, fobs... whatever! 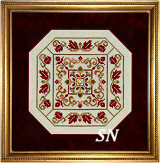 Stitched on 28ct Clay linen, choose Ginger Snap, Desert Mesquite, Red Currant, Queen Bee and Tiger's Eye hand-dyeds. Cute little floral urns for autumn... something you can leave out well into November! A small momento commemorating something special, or simply a reminder about how to approach every single new day... this trio of small charts can be worked on any count fabric you wish, in any color combinations you love. 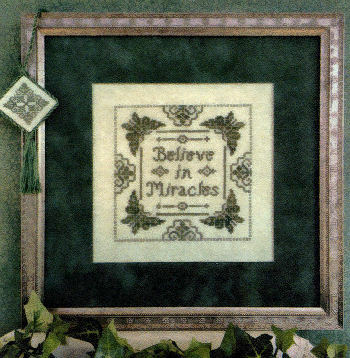 No special stitches, no extra embellishments... just simple and pretty. Offered as a chart. 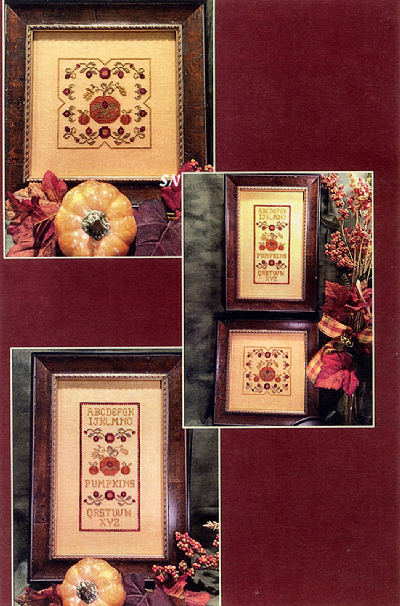 Stylized pumpkins... soft moss, gold and cinnamon hand-dyed threads... Desert Sand linen... that soft 'lizard litter' cushion stuffing... this pattern offers a subtle reminder of the Autumnal season without screaming bright greens and purples, skeletons and squashes!!! Finish any of the trio of designs any way you wish... nothing is too big... just pretty reminders of the colors and flavors of The Season! Offered as a chart. 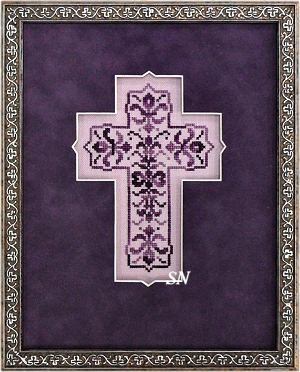 Lovely lavenders make up this classic cross -- this pattern would be pretty in lots of color choices! 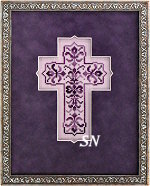 The cross measures 5 x 3-1/2 on 32ct... choose your fabric first, then find thread to complement! 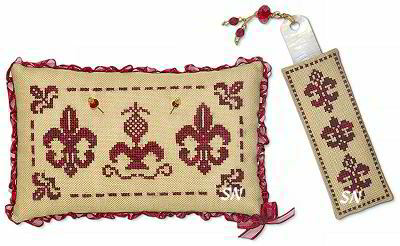 We have pretty pin cushions and scissor fobs, beautifully stitched in hand-dyed silks -- all with a gently, swirled Fleur de Lys motif! Pictured here are three of the five designs that are so simple and elegant... the red (cushion finishes approx 3 x 5) are offered together in one chart, the green (large square is approx 4 x 4) and then the blue. 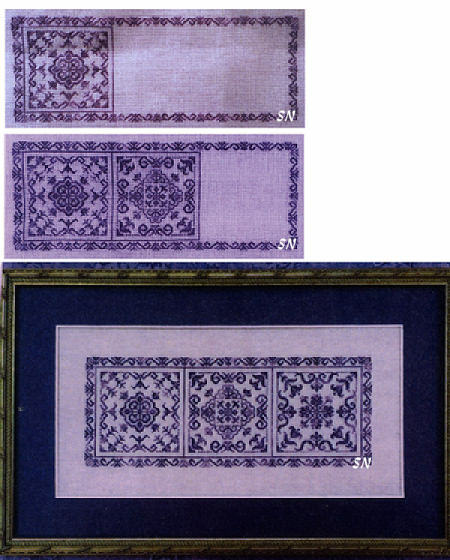 Remember that you can stitch any of these in ANY colors you wish... what makes them enchanting is that graceful Fleur de Lys motif, and the gentle shading of your silk thread. 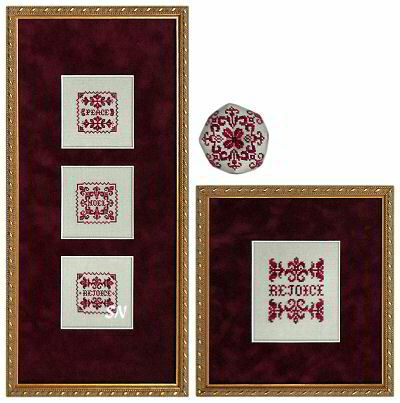 Fleur de Lys for Me is the red set -- it features a 3-inch ruler case. 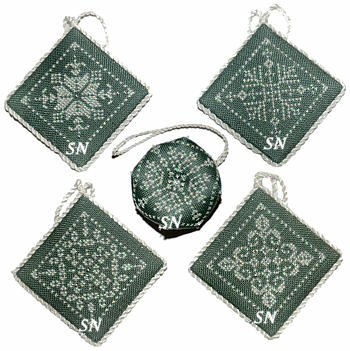 Swirl offers a 1-1/2 x 2-1/2 scissor fob with a rouched ribbon edge treatment. 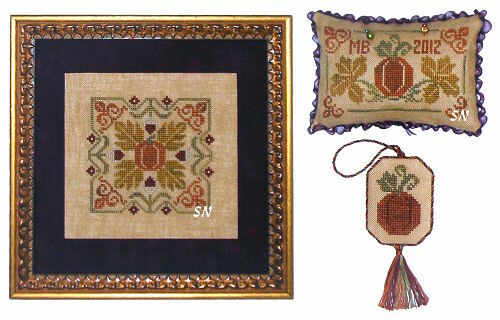 Square delivers one square cushion, and a miniature square version finished into a biscornu. Understated, and very pretty, all are offered as charts. 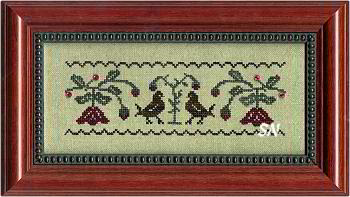 A sweet piece -- 2-1/2 x 7 on Week's 30ct Tin Roof hand-dyed linen, just the birds and their berries! If you have some tiny red buttons to attach as berries, that adds a bit of charm. Coded for DMCs or overdyeds.